Christmas is often a time of year when families jet off to warmer climes for a winter sun holiday – and solar protection for youngsters is just a click away with Little Terra’s sunhats, sunglasses and UV sunsuits. A popular choice for holidaymakers at any time of year is the Jack Wolfskin reversible Mosquito Hat. Featuring, UV protection of UPF 40+, the wide-brimmed hat also includes insect repellent to help keep mosquitoes away. Carolyn said: “At Little Terra, our children’s sunglasses have been carefully selected to filter UV rays and shield young eyes . “Sun rays come from all directions, and the most efficient method of protecting the eyes is to wear good quality sunglasses, and to also wear a protective hat. “A wide-brimmed hat can protect eyes from any rays coming from above or below the sunglasses – and choosing wraparound sunglasses rather than standard design frames offers further protection. “Design features such as soft temple ends and soft silicone nose and brow pieces embedded in the frame also make for a more comfortable fit. UV sunsuits are ideal for holidays because, as well as offering protection from rays, they take up little space in a suitcase, are easy to rinse through at the end of the day and quickly dry out, and can be worn out sight-seeing, by the pool, beach and in the sea. 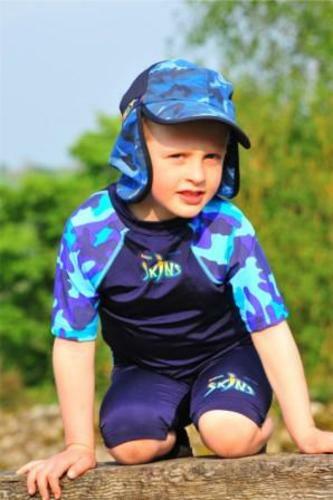 Little Terra retails the time-proven and trusted range of UV resistant clothing for children with the Radicool 100+ UPF Skins range, from Australia. The range features all-in-one suits, tops and shorts and hats which incorporate protection for the back of the neck. Carolyn added: “Australia has pioneered extremely effective methods of sun protection over the years and that really appealed to us when we looked at the best range to stock. Little Terra is a children’s online retailer specialising in high-quality clothing and products that support the lifestyle of active young people and their parents. Every item is carefully chosen by the company’s managing director, Carolyn Budding, who brings her own experience as both a specialist buyer and a mother of two to ensure products are more than capable of meeting the demands of modern families. Little Terra stocks winter clothing brands brands including Spyder, Jack Wolfskin, Hi-Tec and Columbia, and other Little Terra brands include the acclaimed Vaude and Bush Baby child carriers, Radicool 100+ UV sunsuits and Sprayway. Little Terra’s headquarters are in Derbyshire, in the Amber Valley. Little Terra is a sister company to Terra Nova Equipment, which is also led by Carolyn and her husband Andy Utting, and designs the world-renowned Terra Nova Tents and rucksacks, the trusted brand Wild Country Tents, and the high-performance Extremities® range of gloves, hats and other accessories. This press release was distributed by ResponseSource Press Release Wire on behalf of Shepherd PR in the following categories: Children & Teenagers, Leisure & Hobbies, for more information visit https://pressreleasewire.responsesource.com/about. Shepherd PR helps its clients stand out from the crowd with innovative communications including media relations, press releases and award entries — as well as a dedicated digital division providing webfilms, videos, online pr and podcasts.